After talking with Owen, I've decided to set up a topic for graphics artists to post any random, one-off sprites for which they do not intend to start any projects of their own, for coders and artists who would like to use them for a finished product. Please provide a unique subject at the start of the post. Please list a description for your sprites. Please provide a preview of every sprite you're contributing, preferably in PNG format. Keep in mind that the forum only supports a maximum of three attachments. If you are contributing more than one sprite in a post, ideally you should have one preview graphic with all of your sprites, and one file containing all the individual sprites (.zip, .tar, .rar, etc. ), if necessary. Please list a license or terms that artists and coders must abide by before using your sprites. You should include a copy of this license either as the third attachment, or bundled in the file containing your sprites. Please refrain from posting. Comments, questions, accolades and criticism about any sprites should be directed to the artist via PM, or in its own discussion thread. The purpose of this thread is to create an "easy-to-view" repository of sprites, discussion of any kind will make it difficult, if not impossible, to fulfill its intended purpose. Moderators are kindly asked to please watch the thread for off-topic posts and move or delete them as necessary. Description: a combine harvester based on Claas Dominator series. I draw it for a truckload, but it fits on trains or simly as an eyecandy object maybe. License: GPL v2, and if anyone uses it i'd like to have my name in credits. I had drawn this today in hopes of making a German Building set but then I realized, I would be busy with other sets. There is a short one and a taller one. Or you can ignore the license, just inform me you want to use it and make sure I am in the credits. Looks nice, would you have time to knock out the rotated views of them? Or put my nick in the credits. ... and another Bangkok landmark. I'm really not sure how the construction parts should be done, I'm just improvising. or someone elses work from the forum, I just tooks screenshots from the start screen. A random London Underground entrance I once drew. An attempt at a different beach tile. I think this was even before the beach tiles that we currently have via newobjects. A florist for the forgotten TARS Industry GRF. Use as you wish, just credit me. 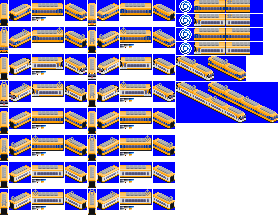 So a month or two ago I was working on some Kintetsu trains and I made these, only to later find out that none of these were used in the Nagoya Area, so I couldn't have them in NATS.